These cookies are fragrant, rich, delicate and dark. These cookies are full of cocoa and spiced with lots of freshly ground cardamon. These cookies are the perfect thing to stash in the freezer for those moments when only a cookie will do. These cookies have got me drinking milk again, though they're also good with tea. I can't find any more words today. These cookies are still worth sharing. Blend the butter, sugar and cardamon together in a food processor until you have a paste. Add the flour, cocoa, baking powder and salt and pulse just until you have a dough. Tip the dough onto a big sheet of cling film then roll into a thick, short sausage of about 5cm diameter. Chill in the fridge for an hour until firm. Preheat the oven to 170C/340F. Line a baking tray with parchment paper. Use a sharp knife to cut as many thin slices of the dough as you want to bake - they should be about 5mm thick. Place on the tray then bake for 7-8 minutes - the middle will have risen slightly. Leave to cool on the tray for 5 minutes then transfer to a wire rack. I bake them as I need them and keep the rest of the dough in the fridge (for a few days) or the freezer (for a few weeks). Eat on the day you bake them - they are at their best when just cooled. Hmm, it really looks delicious ! Might try this recipe soon. Thanks ! Simple but definitely a winner recipe! Sometimes pictures are all you need. Chocolate and cardamom are two of my favourite things :-) Yum. Such a wonderful flavor combination! I can't wait to give these a try. Cardamom is one of my favorite spices. I think I've just found the cookies I'm looking for to make ice cream sandwiches with! Chocolate and Cardamon sounds amazing, and I love how neat and uniform in size they are too. 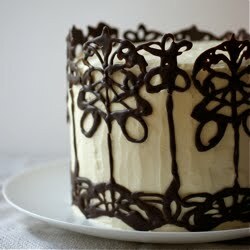 I love the combination of chocolate and cardamom; so very lovely and these pictures are just perfect. These sound like an absolute delight! I love a simple spice cookie like this! Mmmm... I am thinking adult only oreos with these cookies. What a keeper! Gonna try it very soon! Sounds fabulous! I made a plum cake with cardamom yesterday (Amber Rose recipe from 'Love, Bake, Nourish' - very good) and am enjoying it so much that your biscuits have been added to my list as I can imagine the cardamom goes well with the dark chocolate. Thank you for this delicious recipe! Just tried it today and all the family LOVED it! These sound amazing, recipe filed for a rainy London day when the January blues are hitting, thank you! Three of my favourite words! Actually you had me at cardamom. That would have been enough. The fact it is chocolate cookies is making me want to descend the stairs at this ungodly hour (4 am) and make a heady batch. Must. Show. Restraint. It took me so long to try cardamom for fear that I wouldn't like it and last Christmas I bought a giant tub of ground cardamom from The Scandinavian Kitchen shop in London and haven't looked back. It's such a beautiful flavour and transforms whatever ingredient it's put with. I'm definitely going to give these a whirl. Hello! Just found your blog via your guest post on The Little Loaf - these cookies sound delicious, will have to try them soon! One of my most favorite milkshakes at home is chocolate and cardamom. Not sure why, but I never even thought of using the combination in another context. These look wonderful! These cookies sound amazing! I love the magnets to hold down your baking paper! that's genius, I've never seen anyone do that before I'm going to have to go get some! I just picked up a new bag of cardamom (intended to be used with some of the first pears of the season that have just appeared at the market) and these cookies sound fantastic! I don't think I have come across a lot of recipes combining chocolate and cardamom but my favourite chocolate brand in Germany just brought out a Chocolate and Cardamom bar so it certainly sounds like a winning combination. Ahh, lovely, I've heard good things about chocolate bars with cardamon but never tried one. I think they'd be great with coffee too. That's good... words are not coming easily at the moment. Thanks Sophie - I love simple recipes like this. It's such a great spice for baking, isn't it. What's your favourite way to use it? It's a good combination - I don't think I'd have ever thought of it myself. Signe's brilliant! Sounds like a plan to me. Though these are pretty delicate and have a v short texture - I'm not 100% certain they'd hold up. Me too - I've always been a big ginger cookie/biscuit fan. Glad you like them. Heh! Sounds like an interesting plan - let me know how it goes. What sort of filling were you thinking of? Ooh, black pepper - I can't quite imagine that. Glad you enjoyed them! Plum cake with cardamon sounds lovely. Do tell me how they go if you try them. That's great! Lovely to know that you all liked them. They are definitely a good cure for a rainy day (or a sunny one, or a cloudy one...). Hehe! Have you given in yet? Aw, that's great! Glad you like them. They're really useful, especially if whatever you're baking is light and won't hold the paper down - we had them as part of our equipment set at Cordon Bleu. Do let me know where you find them, I could do with some more. I made them with Ricotta honey filling ( simillar to cannelloni cream. My family loved them! Freezer stashed cookies sound like an excellent idea to me Emma. Yes, that's true - I find it makes a lot of difference to chocolate chip cookies. As I mentioned in this recipe, I bake these in very small batches - say two - when I want to serve them. So the majority of the dough usually sits in the fridge or freezer for at least 24 hours. My own lactose-free version of these cookies! Thank you for sharing the recipe! After 10 min of baking at 170 they still feel a bit foamy and not firm to the touch. Should it be like this? Were they too chilled to start with? So they need more time? Glad you sorted it out, sorry I didn't reply sooner. I've made the recipe five times now and baked the cookies in batches of 2 or 3 so I've tested the timing a lot of times! I hope you liked them? First batch I did overbake, so they were a bit bitter and too crumbly. The second batch though was perfect :) thanks for a fab recipe.